We are committed to supporting veterans’ service organizations through a variety of programs such as Honor Flights, annual Veterans Day breakfasts, Hy-Vee Round Up, and participation in programs such as the U.S. Department of Defense’s Employer Support of the Guard and Reserve. These programs align with our long-standing commitment to serve as a community partner and our mission to make lives easier, healthier and happier. 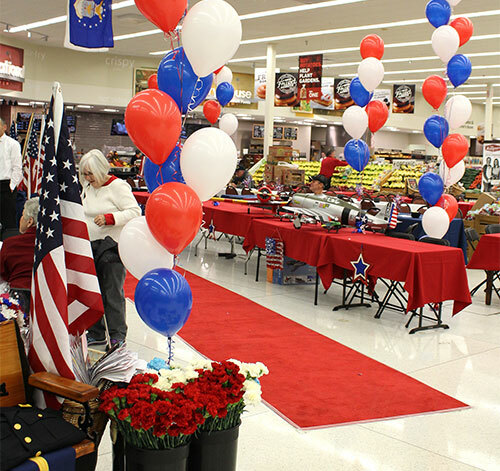 Hy-Vee provides Honor Flights to honor America's veterans for their service and sacrifice. Since 2009, Hy-Vee has sponsored Honor Flights for hundreds of veterans around the Midwest, providing transport to Washington, D.C. to visit and reflect at memorials. Top priority is given to senior veterans who served in the Korean War, Vietnam & World War II. The Honor Flights are provided at no cost to the veterans attending. Hy-Vee is supportive of our employees' participation in the military and has signed a statement of support pledge. We have committed to provide managers and supervisors with the tools to effectively manage employees who serve in the Guard and Reserve. We appreciate the values, leadership and unique skills that service members bring to our team and our company will continue to recognize and support our service members and their families.